A shiny white and silver holiday party invitation -- perfect for business or personal holiday parties. Assembly Required. Easy to personalize and decorate. Very stylish with a special, matching sliver envelope. Scored foldover top piece (measures 1 inch) with two die-cut holes for easy assembly. You can tie a traditional bow or use the binding style pictured. 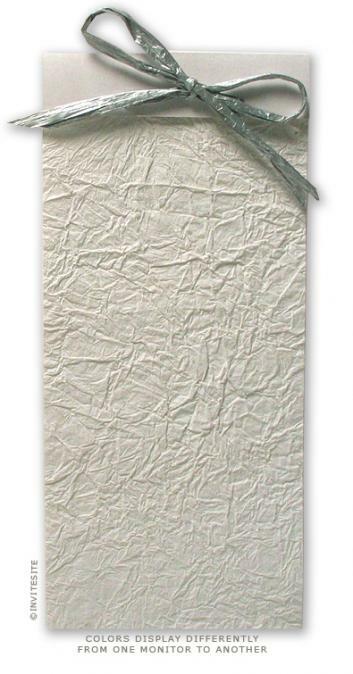 Translucent overlay sheet of handmade cotton rag crinkle paper with sparkly mica inclusions. Bound with silver paper-rafia. Kit includes a matching silver policy style envelope (stylish - flap at top). Papers are imported for Italy, overlay paper handmade in India. Invite/binder Sheet:diecut and scored. Pearl white Italian pearlescent cardstock 105 lb.